Over the years, I have been fortunate enough to eat at a lot of restaurants that are part of Disney World. There are so many places to eat, you really can’t go wrong. As impossible as my title seems, I’m going to give it my best effort and give you my top ten places to eat. I’m going to count down from ten. This quick service restaurant serves up standard fare — pizza, chicken nuggets, sandwiches, etc., but what makes this place good to me is the location. Situated behind Cinderella’s Castle, right next to it’s a small world, this location even has windows that look down into the launch area for the popular attraction. Couple that with it’s Old World charm, and it becomes a place for us to eat at least once per trip. Located over at the American Adventure pavilion on the World Showcase at Epcot, this quick service restaurant, like Pinocchio Village Haus before, serves standard American food such as hot dogs and hamburgers. However, what makes this place a really great place to eat is the large, open courtyard seating — which holds probably 200 people (although I don’t have exact numbers). Additionally, there is an old style military band that plays periodically in the courtyard, and they are well worth the wait if you decide to stay and listen to them. At number eight in my list is the Flame Tree Barbeque, located over at Disney’s Animal Kingdom. The Flame Tree is one of the best quick service restaurants in all of Disney. This restaurant serves up a lot of great food at a good price. We don’t eat here every year because some trips we only make one trip over to Animal Kingdom, and often we have a big dinner planned somewhere else that day, so we don’t want to overeat. However, if you ever have the chance, check out the Flame Tree! Ohana is Hawaiian for family, and as a result, a meal at ‘Ohana is served family style. We ate there in 2009 for breakfast, and had a wonderful selection of sausages, waffles, eggs, fruits, biscuits, and other delightful dishes. The character breakfast also included visits by Lilo, Stitch, Mickey Mouse, and Pluto, with numerous photo opportunities and autograph sessions. It was a great meal breakfast, and we enjoyed it immensely. If you want a quick place to grab some good food, this is the place. Serving everything from yummy breakfast items like cinnamon rolls, sandwiches, and even peanut butter and jelly sandwiches for picky eaters like Sophie, this is the place to be. One step inside the shop and you are inundated with all sorts of sweet smelling treats, just begging you to try one out. It was here where one of our Disney memories was created when Sophie was presented with her huge chocolate chip cookie, courtesy of Cinderella. Now we have reached the top five in our list. Starting us off is the Liberty Tree Tavern at number five. Located in Liberty Square in the Magic Kingdom, this restaurant was one of the ones that Cindy and I ate at when we were “eating our way through Disney” in January of 2001. At that time, and again when we took Sophie and Riley there for Sophie’s birthday, the Liberty Tree served dinner and also had character greetings with Chip and Dale, Minnie Mouse, and Pluto. At this point, though, looking at the page linked above, it doesn’t appear that there are any characters at the Liberty Tree. If that is the case, I might have to bump this down on the list some. However, the food is still delightful, and the deserts are really awesome! Coming in at number four we have Cinderella’s Royal Table. The beauty of Cinderella’s Royal Table is in the details. A picture with Cinderella herself, with prints included in your meal. Going up the stairs of the Castle to a site in the dining room overlooking Fantasyland. A delicious meal, served with a Princess Wand for your little girl to make wishes with. 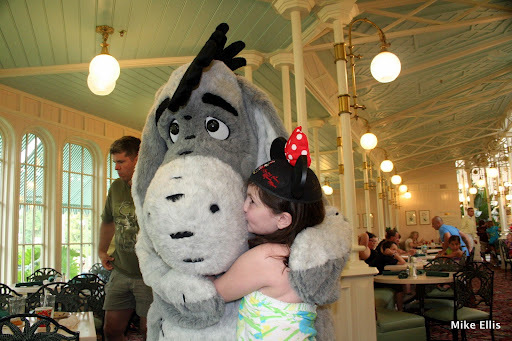 Character greetings with other Disney characters (the list varies from time to time). It all adds up to a top five restaurant in my book. I imagine that I will receive some criticism that it is ranked “only” number four in my list, but the top three I have I believe are better. The Crystal Palace continues to be on our list of restaurants to eat at every year. The place has it all: a fantastic building, an all-you-can-eat buffet, and best of all, character greetings from Winnie the Pooh and his friends Piglet, Tigger, and Eeyore. 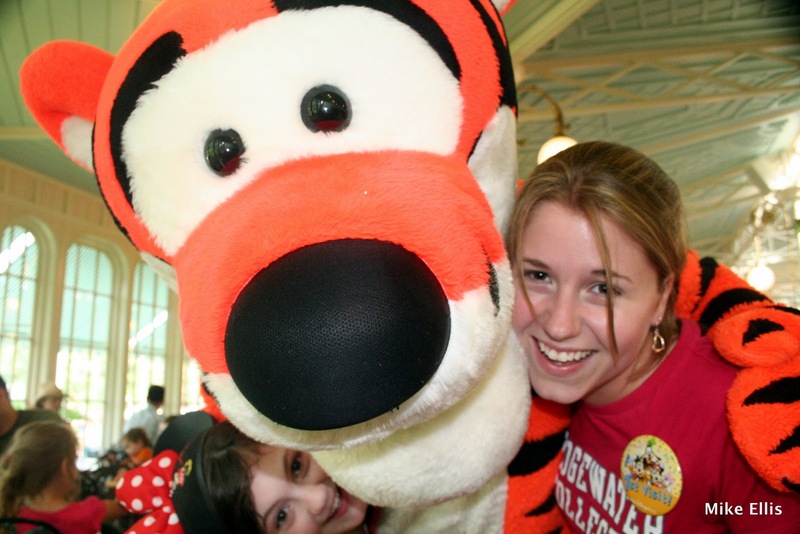 What is better in your opinion — having Tigger ham it up for the camera, sticking his big snout closer to the camera, or getting a great one-on-one with Eeyore? Wait, I know what’s better — sharing the moment with your Cousin Stephanie, that’s what! And coming in at number two…Akerhus Royal Banquet Hall located in the Norway Pavilion of Epcot! This restaurant is listed at number two on my list for several reasons: First, it all starts with a family picture with Belle — and the prints are included in the cost. Secondly, the Royal Banquet Hall is an incredible room, take a look at the link above to get an idea — but you’ve got to see it in person also! Third, the meal starts with a traditional Norwegian buffet of cheeses, meats, breads, and salad to get you started — this is so good I could almost just stick with that and call it good. However, then you get to choose one of several traditional dishes. You can check out the dinner menu here. The last time we ate, which was in June, I had the Traditional Kjottkake, and it was delicious! In addition to all of this, the meal we had in June included visits with Cinderella, Sleeping Beauty, Snow White (that was the first time we had ever seen her here, so that was a big treat! ), and Ariel. If you have never eaten here, try it out — you will be happy you did! And finally, my number one restaurant in all of Disney World to eat at…The Garden Grill Restaurant, located in The Land Pavilion at Epcot! What makes this restaurant unique, and my (as well as Sophie’s) favorite is the circular nature of the restaurant. The restaurant itself spins ever so slightly, taking you in a 360 degree view of the Land Boat ride below. In addition to the coolness of that, you also will enjoy a family style dinner of flank steak, roast turkey, and sustainable fish (that varies), along with all of the fixings, and a delicious desert afterwards. To top it all off, you will be greeted by some of Sophie’s (and my) favorite characters: Chip and Dale, Mickey Mouse, and Pluto. This restaurant is such a favorite of Sophie’s that she has already told us that she plans on taking her date there when she is old enough to date! How’s that for planning ahead! That, my friends, is my list of my top ten restaurants to eat at Disney World. In addition to my top ten, I am also including my honorable mentions here. These are restaurants that I have enjoyed, but not enough to visit them every year or two. If you haven’t tried these out, I recommend them as well! There really isn’t a bad restaurant in all of Disney! All of these restaurants are quite good for various reasons, whether it be for the cuisine, culture, selection, or location, but just not good enough to make my top ten. Before I leave you, I think I should point out that most of these restaurants would not have been enjoyed by us except that we choose to take advantage of the Disney Dining Plan. If you can do it, I recommend it. Some people claim that it isn’t as good a deal as it used to be, but I disagree. In a future post, I’ll talk up the plan. Thank you for reading, and feel free to post any comments, or even your own top ten list! My list of 10 places I want to eat at Walt Disney World! Thanks, Stephanie! June 17th – 24th, 2011 — that is the next trip (tentative dates, but ones that I think will be met)!